"Development Made Easy Part 4." Please Don't Close This page Until You Have Downloaded Part 4 of the E-Course As This Page Will Not Appear Again. May I suggest that you print out this "Thank You" message for help in remembering the download procedure. 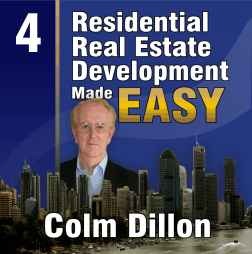 In a moment you'll download your eBook and start on a new and exciting journey with me into your personal development, using property development as your vehicle. Your eBook is in PDF-Zip format. It is 'Zipped' for speed of tranfer over the web to you. The PDF format of the eBook allow you to navigate around the book easily, bookmark pages and much more. Once you 'click' the Download Link below, a new screen will appear. It gives you the option of Opening the ebook or Saving it. Please select Save. Another window will appear showing your 'C' Drive, if that is the Drive you are currently saving material on. Click Save in the right hand corner and the ebook is saved to your computer. To read the ebook, go to the Drive you have saved it to and double click on the ebook icon. As you have downloaded Winzip & Adobe, a new window will appear. Click on Open Winzip ... click OK.
Then Click Run Winzip ... now your ebook will appear and you can start studying it.